The manuscript A Two-Scale Generalized FEM for the Evaluation of Stress Intensity Factors at Spot Welds Subjected to Thermomechanical Loads, by Hoayang Li, Patrick O’Hara, and Armando Duarte, has been accepted for publication in Engineering Fracture Mechanics. Preprint available on ResearchGate. Angelo Simone (University of Padua), Alejandro Aragon (Delft University of Technology), and I will offer a short course on Enriched Finite Element Methods at the upcoming U.S. National Congress on Computational Mechanics, Austin, TX. Detailed lecture notes will be distributed to the attendees. Further details are available at the links above. Prof. Duarte will deliver a plenary lecture on Recent Developments in the Generalized Finite Element Method at the 15th U.S. National Congress on Computational Mechanics, Austin, TX, July 28 – August 1, 2019. The manuscript A Stable Generalized/eXtended FEM with Discontinuous Interpolants for Fracture Mechanics, by Alfredo G. Sanchez-Rivadeneira and C.A. Duarte, has been accepted for publication in Computer Methods in Applied Mechanics and Engineering. 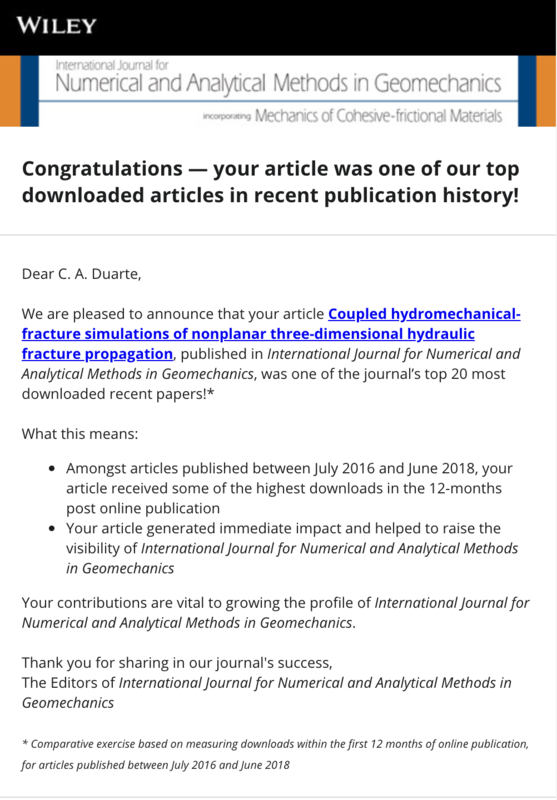 The article Coupled hydromechanical-fracture simulations of nonplanar three-dimensional hydraulic fracture propagation, co-authored by Piyush Gupta and Armando Duarte and published in International Journal for Numerical and Analytical Methods in Geomechanics, was one of the journal’s top 20 most downloaded recent papers! I lead a group of researchers who focus largely on the Generalized Finite Element Method (GFEM). Research papers, presentations, and information on the software that we write is made available through this site. Check out the navigation at the top of this page to learn more about the work that we are doing. Copyright © 2014 Prof. C. Armando Duarte. All rights reserved. Any questions? E-mail me at caduarte@illinois.edu.